Looking for adventure in Meteora? Don't miss a rock climbing session when you visit one of earth's most amazing creation: Meteora. 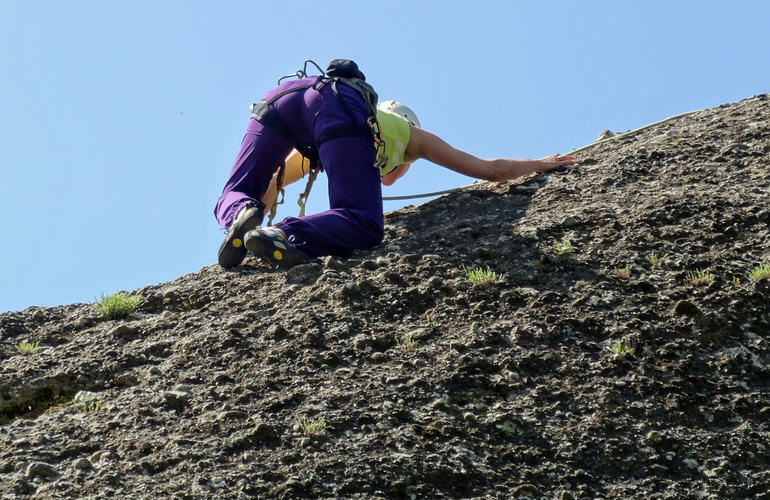 It doesn't matter if you have never tried rock climbing before - your experienced local instructor will teach you how to take your first steps into rock climbing. An amazing tour for beginners or experienced climbers who wish to enjoy unique views to Meteora. Meteora has lots of routes to follow. The rock tour is designed for individuals or groups looking for a fun filled morning or afternoon of single pitch, top roped climbing. Of course you need to be have a good physical health to start rock climbing. But once you get started rest assure that you will get rewarded with the views to Kalambaka valley and the monasteries of Meteora. All necessary equipment is provided by the guides. No previous experience required to participate as the guides will show the basics before going rock climbing, however a good physical level is necessary. Very supportive and patient guide. Enjoyed the activity a lot! Great for a beginner, but definitely not enough challenge for somebody who climbs. I mentioned to the organizer and guide that I climb a lot, and yet he takes us to a beginner wall, AND charged me 15 euros more (I had already paid 60) because he said it's more expensive for advanced....They used the same equipment, and what I did what definitely not challenging...Bummer. Also, communication is less than soso with the provider. Would not recommend. Challenging, do expect a bit of a workout! But they help you all the way!